Let’s go back in time, to when Velocir was completely stripped down to a bare hull. Yes, that glorious moment when the interior was saying “paint me, I have no wood in me and am already a filthy dust pile!” But no one heard the calls. Fast forward to cruising Velocir and the paint is porous, crumbly and very susceptible to mold. If only we had realized!! Of course, that would have made things easy…. 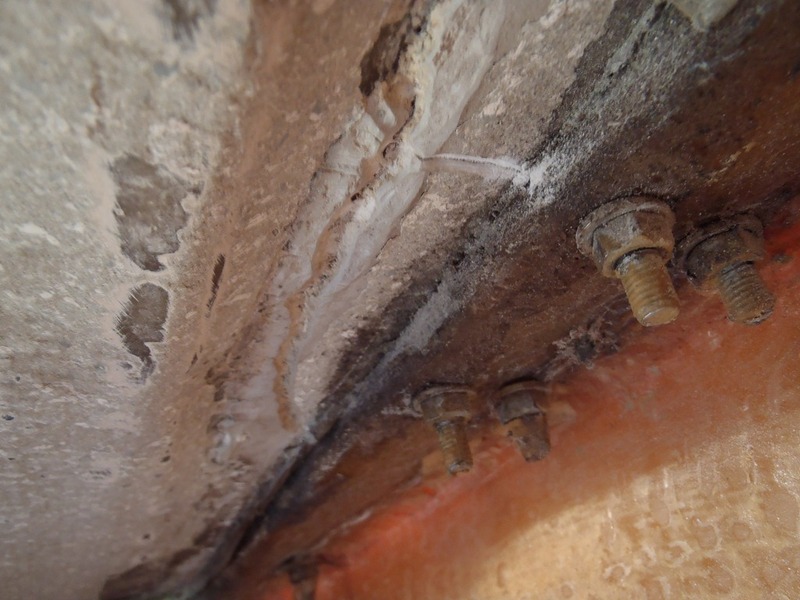 There are two reasons why the interior desperately needs to be painted—mold and flaking paint. 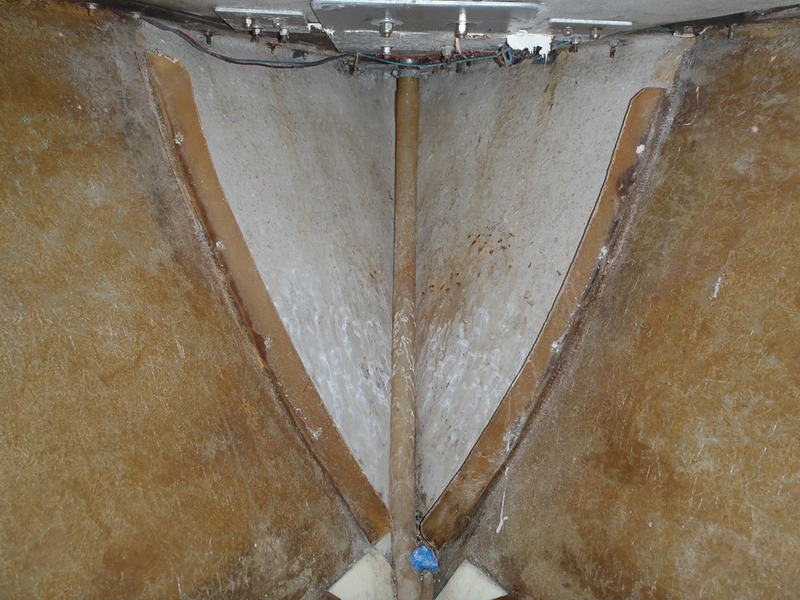 Why is this happening—this is caused mostly by A) porous old paint on a bumpy fiberglass surface B) a gel-coat like filler was used along the outer 1-2 inches of the hull right where the deck meets the hull. 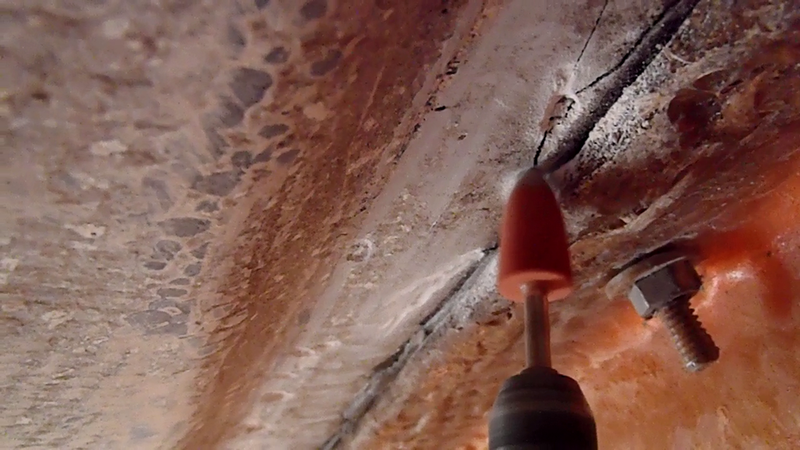 This filler has flex cracks, or in some cases just crumbly texture, causing a mold habitat. As the cracks held moisture the paint started to flake and fall off. The paint is not adhering to the filler at all anymore. To solve this problem Amelia is going to tackle this pain of a project. It is a pain because A) you have to be a gymnast to work upside down in these cramped conditions B) it is messy, mess everywhere all over our home C) the wood paneling limits access to the far reaches of some areas and gives little to no clearance to paint between wood bulkheads and the fiberglass. It is a delicate process to do the job well, without focusing on all the imperfections that will inevitably happen. 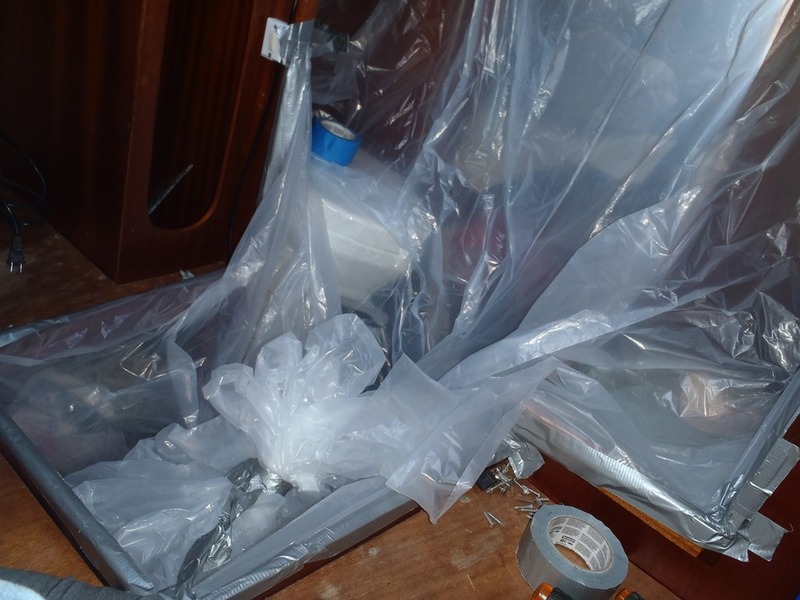 Beginning with the nice vision of a fresh, bright and clean Velocir in mind, Amelia first took out any hardware that needed to be removed for sanding and duct taped a plastic sheet to keep dust out of the main cabin. Then, using a rotary sander with 80 grit and a little “mouse” sander with 120 grit, she sanded the surfaces thoroughly. 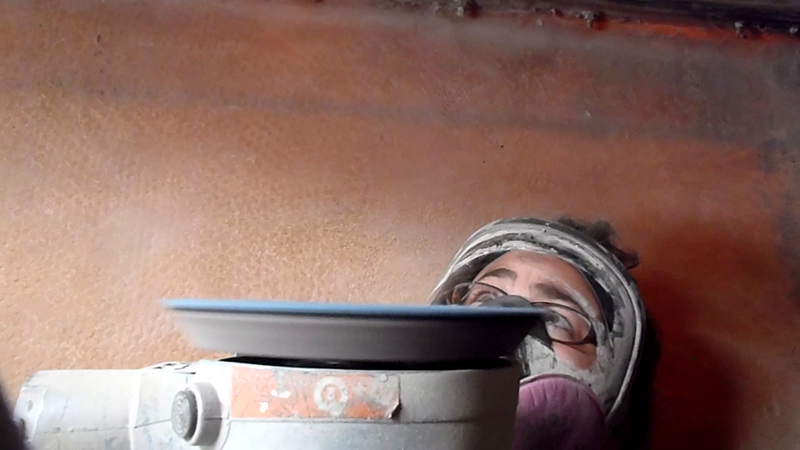 Around the edges of the hull where the paint was flaking, she used a chisel, and then hand sanded the surface. About halfway into the project Amelia started to regret the undertaking. Dust everywhere, sanding in corners, upside down, around windows and other obstacles. Her arms started to feel weak from pushing the sander against the hull. What a mess the boat was! But it was too late to turn back now. 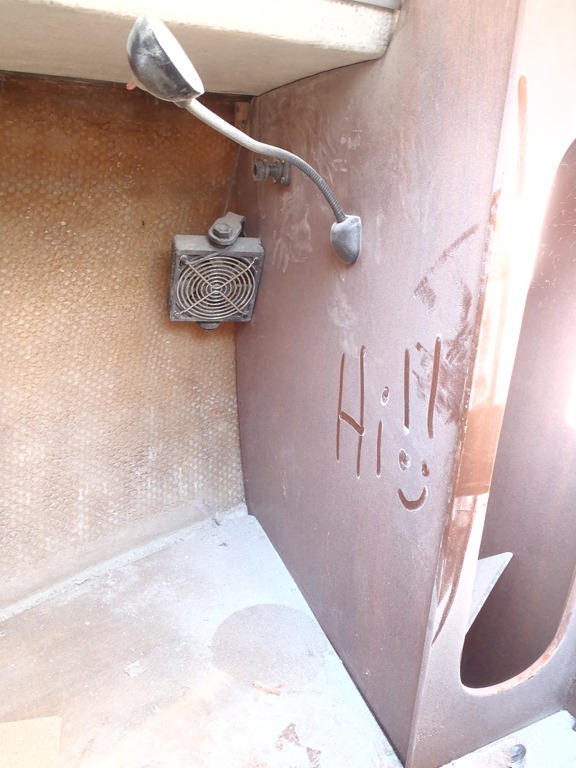 The interior was now sanded and smooth, but very dusty. Amelia used a shop vac to get most of the grime off every surface. Then, she used diluted bleach water and wiped down every surface. Some mold still hid in sanded areas, so this really cleaned things up! The duct taped plastic shield worked great! It didn’t stick to the varnished wood or leave any residue. 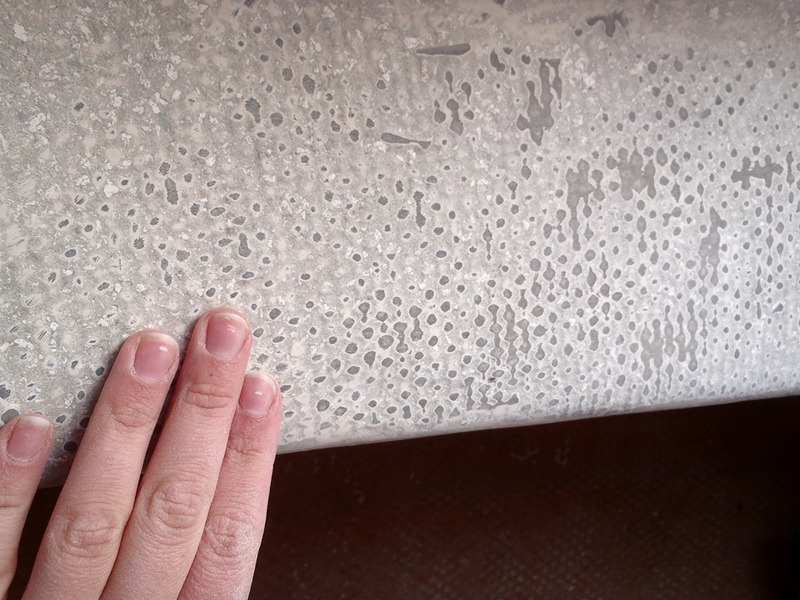 On outer edges of the hull, an epoxy-like filler was used. This is where the flex cracks happened. Using a dremel, Amelia gouged out the cracks until they were smooth. There were also crumbly areas that were cleaned out. 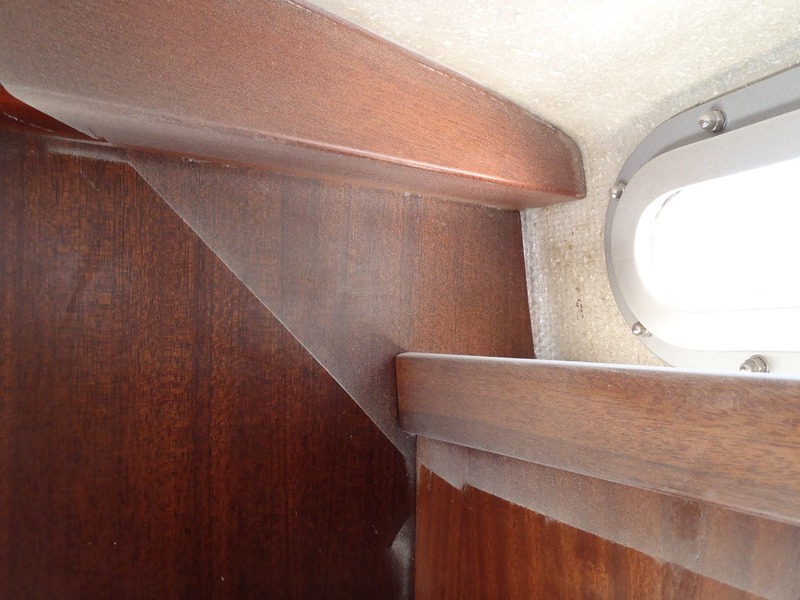 Most cracks were superficial, but two (by the water tank input, and by the starboard lifeline stanchion) were 1/8” deep. To fill these cracks we needed something that a latex based paint would adhere to. It also could not be too rigid or else it would crack again. 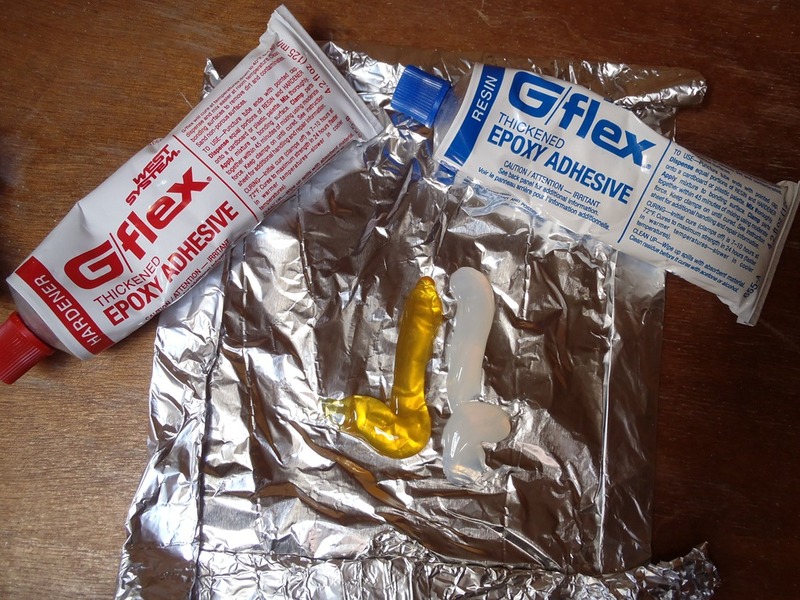 Our solution was g-flex, a flexible epoxy that we used to repair our inflatable dinghy’s oar locks in the Bahamas with great success. It is easy to mix the 1:1 solution and apply. The application was very simple because it did not want to move around, even when applying upside down. At times (probably because it was so cold) it got stringy but was manageable. Once the epoxy cures it will be sanded, wiped down with acetone and the entire forward interior will be ready to paint. First we will use a primer, then glossy paint. Hopefully the weather will warm up for that project soon!